You are here: Home / Work & Business / Digital Nomads: can Malta attract them? Digital Nomads: can Malta attract them? Digital nomad lifestyles are not for everyone. However, if you like traveling, meeting people and the freedom to work whenever and wherever you want, it might be a working lifestyle to opt into. It can offer new ways to manage a work-life balance that allow you time to learn new skills such as exploring cultures and cuisines, or the chance to simply chill out meditating, exercising and so on. 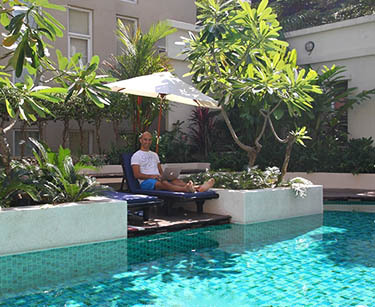 Maltese Internet specialist Jean Galea recently returned from a four-month spell as a digital nomad travelling in Asia, primarily in Thailand. He talks to us about how the lifestyle enabled him to live out his dreams. Jean feels that not only should more Maltese try out a digital nomadic lifestyle, but also that Malta can be a place where digital nomads come to fulfill some of their own ambitions. He sees a mentality shift as key to inspiring both ends of the digital nomad spectrum. We intend our interview with Jean to spark discussion about the viability of Malta as a viable digital nomad destination, providing a new type of visitor stay on the islands and the chance for greater interaction among local and overseas digital cultures and creatives. Digital nomads have tended to avoid Europe for obvious reasons – developed tourism industries, cost, lack of opportunities to live a different way of life, less exciting destinations, and so on. Malta may be easy to move to and live in – English speaking, relatively good value etc – but on paper it seems not to check boxes on the digital nomad’s wishlist. Why do you feel it could fit the bill as an ideal digital nomad location? In my opinion Malta may be the best place for a digital nomad in Europe, although it remains relatively unknown especially among non-European nomads. Most digital nomads look for a new cultural immersion, affordable cost of living, a beautiful location and excellent climate. I believe Malta can deliver on all counts. The only thing that Malta misses is of course a digital nomad community and a different mentality when it comes to jobs and careers. But then that’s the reason why I’m talking about Malta in the first place, in order to change this status quo. Would it be fair to say that your interest in promoting Malta as a suitable digital nomad destination is tinged perhaps by a sense of nostalgia for homeland after a good few months on the road as a nomad yourself? What motivates you to promote Malta among the nomadic ‘tribes’ out there? Rather than a sense of nostalgia, I think my interest in promoting Malta as a suitable digital nomad destination stems from my vision for a more modern attitude towards work and career in Malta. I have always disliked the pigeon-holing of our education, which also comes from most parents’ mentalities unfortunately. From a young age, our youngsters are pushed and pushed to perform well at exams, and are then expected to secure a ‘good job’ as soon as they graduate (or sometimes even earlier) and ‘live happily ever after’. Don’t get me wrong, I very much value education and spent a good five years at University in Malta and UK. What I want to challenge is the mentality and one-dimensional approach to education and life in general. Being a digital nomad is definitely not for everyone, but I want to make sure that those who have it in them to do such a thing are not restrained and have their ‘course corrected’ until they end up unhappy on the career ladder. The digital nomad lifestyle is one that can be lived perpetually or just for a year or two. What’s more, you can do it at any point in life. I’ve met digital nomads who are 20 years old and others who are in their 50s and 60s, and of course all the ages in between. That’s the great thing about being a digital nomad, it’s a flexible lifestyle and it gives you a lot of freedom. You’ve recently set up a Facebook Group – Malta Digital Nomads – to act as a hub for those interested in experiencing ‘nomadism’ on the islands or in promoting it. How do you see the group/initiative developing? What, if any, infrastructure would you need here and what entities would you perhaps need to galvanise into action to enable this new niche of ‘tourism’ to get going here? I am not so inclined to look for official support for digital nomads but rather I want to foster the development of such a mentality on a personal level with other people. That is why I set up the Facebook group. I would like the group to act as a source of information for digital nomads coming to Malta, a means of communication and organisation for those who are already in Malta, and a place where Maltese people who entertain the idea to find support and information from others who have lived/are living the digital nomad lifestyle. On the other hand, having more and more cafes providing good internet access would definitely help us digital nomads. My mind boggles as to why, in 2013, it is so hard to find a cafe with free Wi-fi access in Malta. And I’m not talking about intermittent connections and 1 megabit speeds. Very close to where I lived in Chiang Mai, in Thailand, I came across what could be more aptly described as a haphazardly-built shack than a cafe; but take note of this, they provided 24 megabit free Wi-fi access. That’s just one example. You’d be hard pressed to find a cafe in Thailand’s digital nomad hubs which doesn’t have free Wi-fi of that ilk. And, of course, digital nomads appreciate that and gravitate to these centres. Would putting Malta on the map as a digital nomad destination be good for the country? A sweeping statement, I know, but perhaps there would be spin-offs in terms of ie. internationalising our local digital culture as people rub shoulders, sparking innovation among Maltese young people, or giving the country a different edge in certain online circles? I think the Maltese are very interested in mingling and exchanging ideas with people coming from other countries. I definitely see a growth in the presence of digital nomads being positive for the country. One must remember that many digital nomads tend to be very interesting, well-traveled people who have loads of experiences to share. From my own experience, you can learn a lot and widen your horizons by having discussions with other digital nomads. To connect with fellow digital nomads in Malta, visit the Malta Digital Nomads Facebook group. You can read more about the digital nomad lifestyle and also contact Jean on his blog, Fit for Blogging. Photo: courtesy of Leslie Vella.